Nawazuddin Siddiqui shared a new poster of Babumoshai Bandookbaaz, featuring himself as the gunman he appeared as in the first look of the film. In the poster, the 43-year-old actor appears to have made a pit stop for some snacking on his way to work, which can be identified as a construction site. But it doesn't seem that the babumoshai is part of the gentry at the site of construction - he is heading there with some ulterior motive, which might require the need of a gun. Well, Nawazuddin also reveals that his character is addressed with titles ranging from bandookbaaz to besharam. "Jane kyun sab humko 'Bae' bulate hain... matlab #BesharamBabu," the actor wrote while sharing the poster on Twitter. The makers of the film unveiled the new poster months after the first one created waves on the Internet. 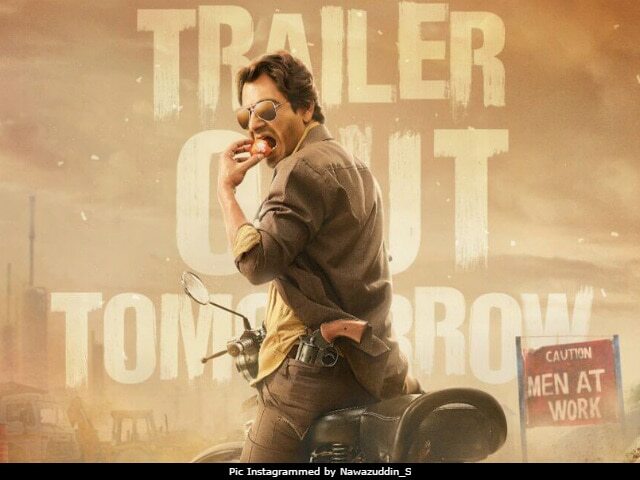 It is also to announce the arrival of the trailer of Babumoshai Bandookbaaz today. Jane kyun sab humko 'Bae' bulate hain.. Meanwhile, we all know that Nawazuddin is all set to match steps with Tiger Shroff in Munna Michael. As if that was not enough that the actor will also rap for a song titled Humre Baap Ka Bitwa Bandookbaaz in the Kushan Nandy-directed film. Talking to Mumbai Mirror, Nawazuddin said: "I love trying new things! I have never danced in my life, and now not only am I dancing but also rapping. When you get down to actually doing it, you realise it's not that difficult." Babumoshai Bandookbaaz casts Nawazuddin as a contract killer named Babu, who is also a romantic at heart. The actor underwent extensive training in gun shooting and action for his role in the film. Babumoshai Bandookbaaz also stars actors Bidita Bag, Jatin Goswami, Murli Sharma and Divya Dutta. Nawazuddin Siddiqui was last seen in Sridevi's MOM and also has films like Manto and The Maya Tape in the pipeline.